The Football Association has asked Jose Mourinho to explain comments made about Anthony Taylor in the days before Manchester United's draw at Liverpool. 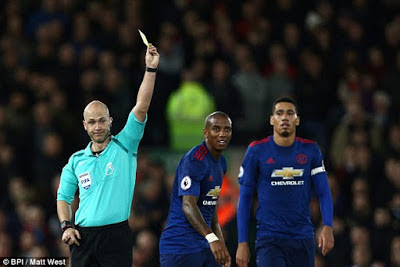 Mourinho questioned concerns surrounding the referee's appointment for Monday night's drab goalless draw at Anfield, claiming 'somebody' was placing undue pressure on him. He has until 6pm on Friday evening to respond to their request. From there a decision will be taken whether or not to take formal action against the Portuguese, with a review taking place next week. Mourinho had added during his press conference that: 'I have my view but I don't want to say anything as I have learned a lesson after being punished so many times.' Managers are forbidden from talking about referees in the build-up to matches and Mourinho would likely face a fine if the FA opt to charge him.